The AziGrip4™ coating platform is a robust and versatile way to functionalize surfaces with polymers. AziGrip4™ reactive compounds act as a molecular glue between different polymers and/or other materials, such as metals and ceramics. 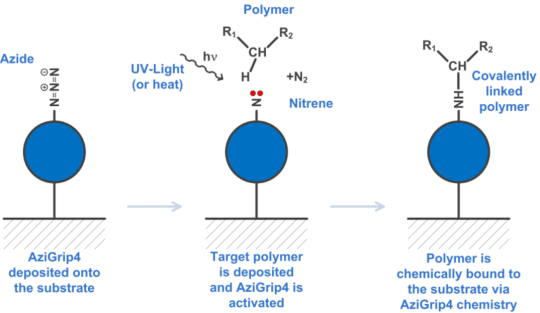 AziGrip4™ technology is based on azide groups that can be activated by UV-light or temperature. Once activated, highly reactive nitrenes are generated. These are capable of undergoing C-H and/or N-H insertion reactions with neighbouring molecules, generating new chemical bonds. The main advantage of this approach is that the “to-be-bound” polymers do not require special functionalization. The coating procedure is very simple: the surface can be rapidly functionalized by dipping, brushing, spraying or rolling. 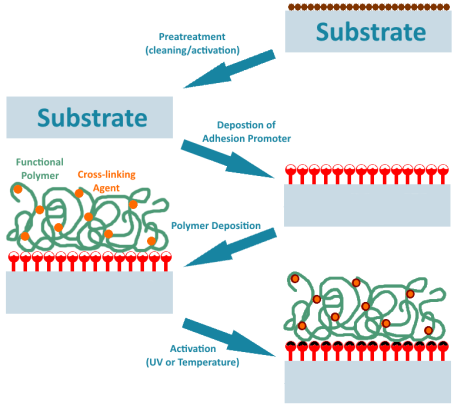 It is a two-step procedure, involving, firstly, functionalization with AziGrip4™ adhesion promoter and, subsequently, deposition of the functional polymer. A few seconds of UV illumination are then required for activation.